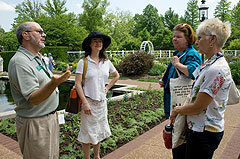 The Missouri Botanical Garden welcomes group tours. Special pricing and accommodations are available for adult or youth tour operators of 15 or more when booked in advance with our Tourism Department. All of these services need to be arranged and pre-paid at least 21 days in advance of the visit date. For more information or to book a visit, click on the Tourism Inquiry Form and enter your complete details. A member of the Tourism Department will contact you as soon as possible. Questions? Call us toll-free at 1-800-332-1286 (Monday–Friday, 8:30 a.m. to 5 p.m.) or e-mail tourism@mobot.org. Booking late? Call us anyway and see what's possible!